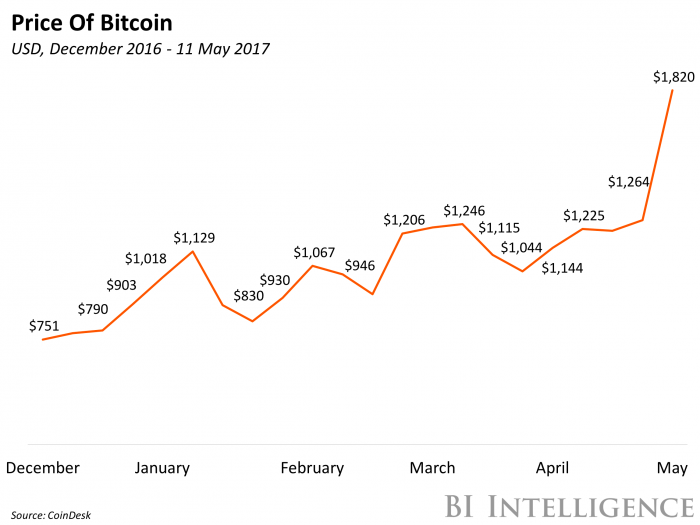 On Thursday, bitcoin prices reached an all-time high, trading at $1,820 at this time of writing to beat last week's record of $1,461. This meteoric rise is likely still being driven by the impetus coming from Japan — trading volumes soared on its bitFlyer bitcoin exchange due to major institutional investment into the platform in February, and the country legalized bitcoin as a currency on April 1. However, as prices continue climbing, prompting more and more people to buy in, questions are starting to arise as to whether the asset is headed for a bubble. On Tuesday, a board member at the Bundesbank, Germany's central bank, issued a warning to the public not to buy bitcoin, saying the bank did not recognize it as a currency, and the cryptocurrency may be facilitating speculation. Investors could be getting ahead of themselves and ignoring potential risks — like the possibility of new regulations hostile to cryptocurrency. Such developments could spook investors and rattle the asset’s value.